This is THE ultimate guide to growing taller. And if you’re past puberty, don’t go anywhere. You’re about to learn height growth strategies that work for YOUR age (or your child’s age). And no, this isn’t another guide that harps on tips like “do the cobra stretch” or “drink milk”. You’re about to learn EXACTLY what you need to do to maximize your growth at every stage of your life. In this intro chapter, I’m going to debunk some common height growth myths, and afterwards, go over the basics of how you can grow taller at your age. How much does your genetics limit your height? What are the most important factors that make you taller? Why does this guide even exist? I mean, isn’t 60 to 80% of your height determined by your genetics? If you do the right things, it’s possible to grow several inches taller than the rest of your family. Here’s a picture of a few NBA players who became much taller than their parents. Let’s start off with the player you already know. Think they got their genes from their grandparents? So let’s look at some evidences that you CANNOT argue against. As you can see, South Koreans are up to 3.1 inches taller than North Koreans on average . Do you think South Koreans have different genes than North Koreans? In fact, the two countries were separated less than 100 years ago (right after World War II). It’s NOT genetics, but food shortages that likely caused North Koreans to become shorter than South Koreans over the years . Now, we can’t verify that their increased income actually made them get taller. But as Dr. Randal Olson predicts, the increase in their income gave them access to more and healthier foods, which meant they were better nourished to become taller . Did the Dutch change their genes to become 7.5 inches taller as a nation? It should convince you that you CAN become much taller by doing the right things (without changing a SINGLE gene). And this guide is going to show you how to do just that. Can I increase my height by 7.5 inches if I’m 25 years old? BUT, it’s still possible for you to increase your height by 1 to 2 inches. In fact, by implementing the strategies you’re about to learn in this guide, my friend grew 1.7 inches (4.3 cm) when he was 27 years old. Now, he did NOT get taller by lengthening his bones, since that’s not possible at his age. So then, how did my friend grow 1.7 inches taller? By lengthening another part of his body that CAN lengthen at any age. And later in this guide, I’m going to reveal exactly what part of his body Peter lengthened to grow taller at 27. You’re ready to learn the most important factors that will maximize your height. Now, depending on how old you are, some of these factors will matter much more to you than others. Also known as Human Growth Hormone, HGH is a biochemical produced in your pituitary gland. It’s responsible for lengthening your bones, and other vital functions, such as: generating cells and tissues, producing bodily fluids, and keeping your immune system strong and healthy. Nutrition is the biggest non-genetic (environmental) factor that determines how tall you become as an adult. There are specific nutrients that boost your bone growth, and this guide will cover these nutrients in detail. Having deep, high-quality sleep every night allows you to maximize your HGH levels, which is essential for growing taller. There are many ways to optimize your sleep, and this guide will show you the best ways to optimize your sleep for maximum growth. There is ONLY one type of exercise that can actually speed up your bone growth. There are many day-to-day habits that can stop you from reaching your full potential height. In this guide, you will learn exactly what habits to watch out for. There are several conditions and diseases that can hinder your growth, and this guide will show you how to prevent them as much as possible. While some conditions can’t be fully avoided, you can still reach your full potential height by receiving the right treatments. Fixing your posture can help you become taller instantly. This guide will show you how to optimize your posture to help you become as tall as possible. Growth spurt describes a period in your life when you grow faster than usual. This guide will show you how you can take full advantage of your growth spurts to maximize your height during these periods. Growth chart is a visual tool that you use to track your rate of growth, compare your height vs the general population, and predict your future height. In this guide, I will go over the exact steps to use them accurately and reliably. Now that you know the most important height growth factors, it’s time to preview the upcoming chapters. While it’s possible to grow taller at any age, you probably know that children can grow much taller than adults. So at the start of each chapter, I’m going to give you an idea of how much you can expect to grow at your age. Depending on how old you are, certain height growth factors will be much more important than the others. For example, if you’re a parent raising a kid, taking care of her diet is more important than anything else. And if you’re a 29-year-old looking to stretch out your height to the last inch, you need to focus on your posture more than anything else. Bottom line: In each chapter, you’re only going to learn the height growth factors that actually matter at your age. After you learn about the height growth factors that are the most important to you, I’m going to give you a summary section for your chapter. In these summary sections, you’ll get to review the most important points, and actionable tips you can start doing right away to get taller. And remember: you can always click on the Contents icon on the top right corner to skip to any chapter you want. If you can’t find the icon: scroll up, then scroll down, and it will reappear. If you recently got a child, this chapter is for you. At this stage, there aren’t too many things you need to do to maximize his height. Instead, it’s far more important to make sure that he grows normally. And in this chapter, you’re going to learn the exact steps you need to take to ensure proper growth of your child. These numbers are simply estimates. In other words, your child will likely grow more OR less than the numbers I just gave you, since every baby is different. Specifically, her height will likely differ, since every baby goes through different patterns of growth spurts. If your child is 0 to 2 years old, he’ll likely go through several growth spurts. Now that you know what kind of growth patterns you can expect, let’s talk about how you can track her growth accurately. By far, the best way to track your child’s growth is using the growth chart. But before I show you how you can use Growth Charts, it’s important to pick the correct growth chart for your child’s gender. After you pick the right growth chart for your child, it’s time to use it to track your child’s growth. For this example, we’re going to use Marie who is 9 months old, and measures to be 27.5 inches tall. At the bottom of the chart, find your child’s age, and draw a vertical line to the top of the graph. Find your child’s height on the left, and draw a horizontal line until you reach the vertical line. Find the curve that’s closest to this intersection, and follow the curve until you get to 2 numbers. 2. Marie’s Predicted Height by 2 Years of Age (which equals 34 Inches or 86.5 cm). What is Your Child’s Growth Percentile? Your child’s growth percentile is the percentage of children who are shorter than your child (who are the same age). Since Marie’s Growth Percentile equals 50%, it means that she is taller than 50% of other toddler’s who are her age. Now, the point of this procedure ISN’T to see how tall your child is compared to other children. Rather, your child’s growth percentile will help you know if she’s growing properly or not. 1. Go through all of your child’s existing measurements, and label them with a growth percentile (using the Growth Chart). 2. If her growth percentile stays relatively consistent, it’s an indication that she’s growing at a healthy pace. For example, if your child’s growth percentile is 45% when she’s 6 months, 50% when she’s 9 months, and 50% when she’s 12 months old, it shows that your child is growing normally. Your child will go through several episodes of growth spurts at random times. In other words, there will likely be times when she outgrows or undergrows her predicted growth percentile on the chart. So if you find that she is at 60% growth percentile at 18 months, but up to 75% growth percentile at 21 months, that is completely normal. However, if you find that your child is way faster or slower than what’s expected of her, you should check with a pediatrician. immediately. Although nutrition is the biggest factor when it comes to your child’s height, you DON’T need to stress over what foods to feed your child right now. Instead, you want to focus on making his transition to solid foods as smooth as possible. If you want to find out if he’s ready to eat solid foods, make sure to ask you doctor. Is your baby 4 to 6 months old? Can your baby hold his head in a steady, upright position? Does your baby mouth his hands or toys? Does your baby show interest to what you’re eating? If you’ve answer yes to all of these questions, and you’ve gotten a confirmation from your doctor, he’s ready to eat solid foods. Optimizing your child’s sleep is super important if you want her to grow properly. Your child needs enough hours of deep sleep every night to produce lots of HGH, which is essential for growing taller, and safeguarding her overall health and development. So how much sleep should she get every night? As much as she needs! Since every baby is different, I can’t tell you exactly how many hours she needs to sleep. If your child has grown out of her toddler days, this chapter is for you. This is one of the best times for her to ritualize height increasing habits, since she has MANY years to grow. In fact, by doing the right things, she can give her future-self several extra inches. So without further ado, let’s dive right into the chapter. Unlike toddlers, you can expect your child’s growth to be much more stable . That’s because your child won’t experience any major growth spurts until he hits puberty. So how much should your child grow every year? You can expect a typical kid to grow about 2 inches (5 cm) every year . However, if your child can apply the height maximizing strategies I’m about to teach you in this chapter, it’s possible for him to grow even more. But regardless of whether he grows 2 inches or 2.5 inches every year, the amount isn’t as important as much as growing at a steady pace. And the upcoming section is all about making sure your child grows steadily throughout his years to come. This may seem like an easy step (and it’s quite easy to be honest). But most people either wing this process, or get it completely wrong. 6. Grab your ruler (that you picked from the previous step), stick it to the bottom of the wall, and extend it up to the mark. After you measure your child, it’s time to find out if he’s growing at the right pace. You’re now ready to use the Growth Chart. Now if you’ve read the last chapter, you probably already know how to use the Growth Chart. But since your kid’s growth chart looks slightly different from a toddler’s, I’ll walk you through the chart reading process with a chart that’s made for your kid. For this example, we’re going to use David who is 6 years old, and is 3′ 7″ tall. So what are these two numbers? 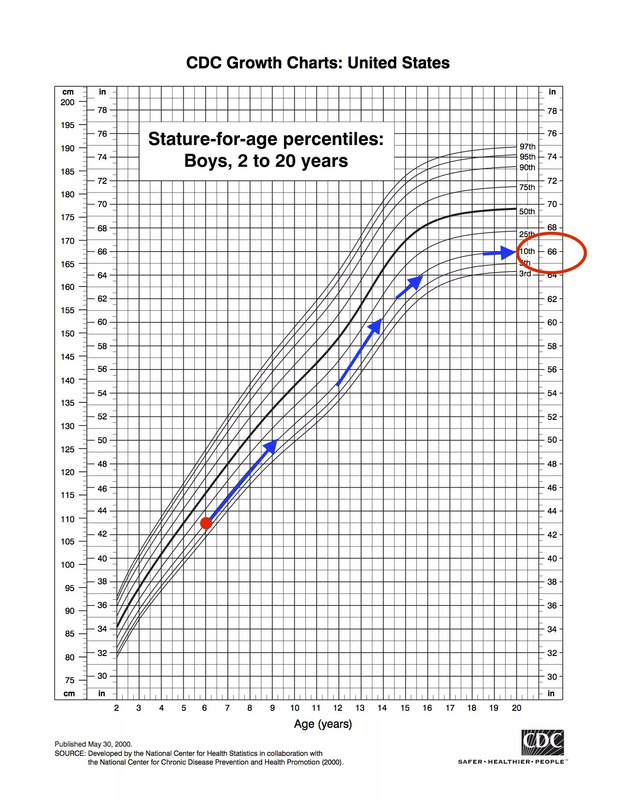 To recap, your child’s growth percentile shows what percentage of children (his age) he is taller than. And since David has a Growth Percentile of 10%, it means that he is taller than around 10% of children who are his age. Since these growth charts and curves are based on estimations, it’s normal for your child’s to grow out of his Growth Percentile throughout his years. For example, if he’s growth percentile is 70% when he’s 7 years old, 75% when he’s 8, and 80% when he’s 9, it shows that your child is growing normally. But since he’s likely not going to go through any major growth spurt, his height should stay relatively close to the line (compared to when he was a toddler or when he becomes a teenager) . If you notice any weird patterns in your child’s growth, mare sure to see your doctor or pediatrician. In the introductory chapter, we covered why HGH is essential for maximizing your child’s height. Therefore, the strategies I’m about to teach you will help your child increase her HGH levels naturally. In other words: Natural HGH is completely safe, while synthetic HGH can be risky if not injected properly. And the bulk of this guide will focus on increasing your child’s natural HGH levels. Let’s quickly dive into each area. Keep in mind: your child’s diet can make or break her height. Just remember how South Koreans became 3.1 inches taller than their North Korean siblings from having access to more and healthier foods . So the better foods your child eats, the more she’ll grow. For a food to help your child grow taller, it needs to contain at least one of the 5 Height Maximizing nutrients. Here is a complete chart of foods that are rich in each of the 5 nutrients. Now, your child doesn’t need to eat all the foods in this chart. Just ask her which foods he likes from each column, and make sure that she consumes each nutrient sufficiently. How Much of Each Nutrient Should Your Child Consume? Here is an overview of the daily recommended intake for each nutrient. Since many protein-rich foods contain lots of amino acids that will boost your child’s HGH, all your child needs to focus on is eating enough proteins each day . Here is a calculator you can use to track how much Protein (and fats, carbs, and calories) your child needs every day. Your child needs to get at least 400 IU of Vitamin D3 per day . I gave you a complete list of all the Height Maximizing foods. I even showed you how much your child needs to consume daily. But remember, even if your child doesn’t nail the daily intake of each nutrition, her body will be conditioned for maximum growth as long as she consumes each nutrient every day. And more importantly, this guide is NOT an invitation for you to ignore all the other nutrients that are important for help your child become healthy (such as other vitamins, iron, zinc, and many more). Bottom line: a balanced diet is key. If you want to maximize your child’s HGH levels for maximum growth, getting a good night’s sleep is a must. Your child needs to sleep deeply and peacefully every night. And in this short section, we’re going to look at a few strategies to optimize your child’s sleep. If you want your child to sleep well, it’s important to optimize her activities when she’s awake. If your child wants to sleep deeply, her environment must promote deep sleep. By implementing the 2 previous tips, your child should be well on her way to sleeping for maximum HGH production. But if she wants to maximize HGH she produces during sleep, you’ll want to put her in bed before 10pm. Studies have shown that HGH peaks between 10pm and 2am [18, 19]. As I mentioned in the beginning of this section, it’s far more important for your child to get deep and restful sleep, than simply getting lots of sleep. That said, you’re going to want your child to get enough sleep every night. So how can you make sure that she gets enough sleep? By letting her wake up naturally (without any alarms). Since every child is different, she will likely need more or less sleep than other children. And the best way to know how much sleep she needs is to let her wake up without any external stimulus. But remember at the end of the day: let your child sleep as much as she wants! Optimizing your child’s nutrition and sleep is by far the most important ways you can increase his natural HGH levels. That said, getting your child to be active on a regular basis will help him boost his HGH even further. ANY exercise or sport will elevate your child’s natural HGH levels. So instead of focusing too much on doing the BEST exercise, your child just needs to stay active on a regular basis to keep his HGH levels high. In the next chapter for teenagers, I’ll show you a specific type of exercise your child can do further boost his HGH. But if your child is 9 years or younger, just being active alone is enough. The first 3 tips in this chapter were all about strategies that an increase your child’s height. But in this section, we’re going to look at 2 habits your child needs to avoid. These habits all have one thing in common: they can lower your child’s HGH. You’ve probably heard that coffee or soda can stunt your growth. And while that’s not true, caffeinated drinks can decrease your HGH . As you know, caffeine can disrupt your sleep, EVEN if you drink it early in the morning. So make sure that your kid minimizes soda intake. You’ve probably also heard that junk foods can stunt your growth. And same as caffeine, it can’t stunt your growth, but it can also lowers your HGH. Junk foods contain lots of sugar, and too much sugar can lower your HGH, since the insulin spike that sugar causes can disrupt proper HGH production . So make sure that your child controls his sugar intake. But unlike simple habits, these conditions are much more severe, and may be harder to avoid. Conditions can disrupt your child’s growth in several different ways. Now, if you want your child to avoid these conditions, you DON’T need to memorize these! This chapter is arguably the most important part of this guide. Because teenagers go through drastic growth spurts that are not witnessed in other age groups. In other words: this is the time when you experience the MOST amount of growth in your life. So if you want you (or your child) to take full advantage of crazy growth spurts that are about to come, you want to be fully prepared for them. And in this chapter, I’m going to help you do just that. With that, let’s dive right into the chapter. They come at different times for everyone. That’s why if your child is in high school, it’s completely normal for him to be much shorter or taller than his peers. Once again, these are simply estimations for the general population. Let’s go back to the tall NBA players who outgrew their parents. Now, I’m not saying that your child can grow 8 inches when he turns 17 (although it’s possible). The main point of me showing you these numbers is to show you that your child can grow rapidly at a very late age. Growth Chart: To Use or Not to Use? In short, Growth Charts help you make sure that your child is growing at a normal rate. All you do is plot your child’s height and age, and the chart will help you predict how tall he’s going to become at each upcoming age. …but NOT when he’s approaching his teenage years. Because your child is likely to fall out of his predicted patterns of growth during this time . I mean, just imagine if these NBA players used these growth charts! They would’ve spent all of their early teenage years panicking for no reason. And even though these players ended up spurting their growth very late, they’re healthy after all. Bottom line: If your child is approaching (or already is in) his teenage years, I’d throw out the growth chart altogether. By default, your child will become much taller after she goes through a growth spurt. However, there are certain things she can do to make herself even taller during this phase. On the flipside, if there is something off about her body or overall health, her growth spurt won’t help her grow as tall as she’s capable of becoming. So in this section, I’m going to show you exactly how your child can condition her body for maximum growth during her growth spurt. HIIT (High-Intensity Interval Training) is a specific type of exercise that boost your HGH levels by up to 450% . As we went over in the intro chapter, HGH is the hormone that is at the heart of lengthening your bones. So the more high-intensity exercises your child does, the more he’ll grow. They can be done with ANY exercise, sport, or activity. So get your child to pick his favorite sport or exercise, and follow the above guidelines to turn it into a HIIT. Can Your Child Lift Weights? If you’re worried that lifting weights will stunt your child’s growth, you don’t have to. Studies have proven that weight-lifting has NO negative impact on your child’s growth [30, 31, 32, 33]. So instead of being concerned about lifting heavy weights, make sure that your child protects himself from growth plate injuries. In short: your growth plate is the part of your bone that makes itself longer . So if your child injuries this part of her bones, it can interfere with her growth . On top of that: your child is more likely to injure her growth plates during a growth spurt, since her bones are less dense when they grow rapidly [35, 36]. When your child goes through a growth spurt, her body needs more nutrients to support that growth. That’s why it’s important to feed her with not only the right nutrients, but enough nutrients every single day. And in this section, I’ll show you how your child can do both. Remember: your child doesn’t need to eat all the foods in this chart. Just ask her to pick her favorite foods from each column, and make sure she eats them sufficiently. Now that we went over what your child needs to eat, let’s talk about how much of each nutrient she needs. In the last chapter, I said that your child doesn’t need to stress over her daily intake. However, if your child is approaching her growth spurt, she needs to pay more attention to her daily intake, since her bones will require more nutrients to support their rapid growth. Should Your Child Do Intermittent Fasting? Intermittent fasting has shown to significantly boost your HGH levels . Having said that, it may not be safe for children or teenagers to fast [42, 43]. Remember: a teenager will need to eat sufficiently every day to fuel her bones for maximum growth, especially during her growth spurts. On the flipside, there is no need to force your child to eat when she doesn’t want to. Just make sure that she doesn’t skip any meals when she is actually hungry. There is a lot of misconception about height growth pills and supplements. But in reality: height supplements are no different than bodybuilding supplements. While taking protein supplements can help a bodybuilding gain more muscles, they won’t help him if he doesn’t have a good diet to begin with. Same goes for your child: if your child doesn’t eat the foods I showed you in this section, supplements won’t make her grow much taller. But once she has a good diet in place, she can use supplements to grow even taller. Which Height Growth Pills Will Actually Work? To put simply: supplements that are rich in any of the 5 Height Maximizing Nutrients will help your child grow taller. One supplement that contains many of these nutrients is Peak Height pills. So if you want to help your child boost her height, I recommend you give this supplement a try. But remember: a good diet is more important than ANY supplement in the world. Up to 75% of your HGH is produced during deep sleep . So if your want your child to maximize her HGH levels for maximum growth, she needs to optimize her sleep. How Can You Convince Your Teenage Child to Go to Bed Early?! This might be one of the hardest part of your child’s life that he can optimize. As you probably know, teenagers like to stay up later at night, go partying, and take part in all sorts of entertaining activities. So how can you convince your child to follow all of these tips to the tee? Simple: explain to him that by sleeping well every night, he can grow taller. And if he doesn’t, he won’t. But if that isn’t enough to convince him, just make sure that he gets enough sleep every night, and that should be good enough to produce enough HGH at night. Now that you know how important HGH can be for your child’s growth, let’s go over activities that can decrease your child’s HGH levels. We already went over 2 of these habits in the last chapter, but here, I’ll introduce 2 more habits to watch out for. ➊ Drinking caffeinated beverages, such as coffee, energy drinks, or pre-workouts . ➋ Consuming too much sugar . ➌ Drinking too much alcohol . Once again, a teenager is a teenager, and there’s a good chance your child will take part in all of these 4 activities some time in her teenage years. So as long as your child doesn’t take part in these activities too often, her HGH levels will stay elevated for proper growth. Just remind her that all of these activities can make her grow less tall, and that will be a big enough nudge if she truly cares about growing taller. Unfortunately, conditions are much harder (if not impossible) to avoid compared to simple habits we just discussed. But often times, your child can still reach his desired height with the proper treatment, as long as he spots them early on. So it’s important that you know how to spot this kind of condition if your child has one, and get treated as fast as possible. If you’re almost (or completely) done growing, this chapter is for you. Now, I have a bad news and good news. You probably can’t become 8 inches taller, or anything crazy like that. You CAN still grow 1 to 2 inches taller. And in this chapter, I’ll explain how this is scientifically possible, and show you what you can do to increase your height, even if you’re a full-grown adult. If you’re still in your teens or early 20s, there’s a chance that your bones are still growing. If so, it’s actually possible for you to grow 4 inches, or even more. In fact, that’s how a basketball player named David Robinson was able to grow 5 inches from age 22 to 24. But EVEN if your bones are completely done growing, it’s scientifically possible to grow 1 to 2 inches taller. I have a friend who recently grew 1.7 inches (4.3 cm) at the age of 27. And you’re about to learn what he did to grow taller at such a late age. Now that you know it’s possible to grow taller as an adult, it’s time to do it yourself. So what the heck’s the difference between these 3 steps? But for step #3 to work, you need to first master steps 1 and 2. So without further ado, let’s dive into step 1. This is an exciting step, because it allows you to literally become taller instantly. So how do you become taller instantly? I know that’s not a ground-breaking answer you were looking for. As you can see in this picture, fixing your posture can instantly make you an inch taller. You’ve probably found the last step pretty easy to pull off. I mean, fixing your posture shouldn’t be rocket science. But maintaining a tall posture is a whole different game. And in this section, I’ll show you exercises to help you maintain your taller posture, much more easily. This is the step you’ve been waiting for. As you probably know, your bones stop growing after you reach a certain age (around late teens or early 20s). If so… how in the world can you grow taller as an adult?? As you can see, your spine contains 24 bones (white), separated by 23 cartilage discs (red). Unlike your bones, the cartilage discs in your spine can grow longer, no matter HOW old you are . How Much Can Your Spine Discs Grow? How much can your spine grow in total? If all you do is increase each disc length by 0.05, you would grow 0.05 inches x 23, which equals 1.15 inches in total. In fact, that’s exactly how my friend was able to grow 1.7 inches (4.3 cm) at 27 years of age. A group of patients (whose average age was 65 years old) were able to lengthen their disc length by (in order to reduce their back pain) . So if my 27-year-old friend, and a group of 65-year-old patients can become taller, you certainly can too. How do you actually increase your disc length? If you want your maximize the length of your spine discs, you need to minimize the pressure on your spine. And the easiest way to minimize the pressure on your spine is to stop lifting weights over your shoulders. Now, as I mentioned in the previous chapter, lifting weights will NOT stunt your growth. That’s because your bones can keep growing no matter what pressure you place on them. But your spine discs are different: if you place too much weight on them, they won’t be able to expand in length. Can You Start Lifting Over Your Shoulders Again? Once you’ve fully maximized your spine length, you can go back to lifting height weights over your shoulders. Because no matter how much pressure you put on your spine, you’ll still be able to maintain your taller height [51, 52]. But until you reach that plateau, do your best to minimize these spine-compressing activities. Maintaining a straight posture isn’t just important for simply appearing taller, but actually increasing the length of your spine discs. But luckily for you, if you’ve already completed steps 1 and 2, you already have a straight posture. So you’re ready to move on to the last Spine Maximizer. In the intro chapter, I explained how HGH is important for increasing your bone length. But what you may not know is that HGH also lengthens your cartilage discs as well [53, 54]. So the more HGH you produce in your body, the longer your spine discs can become. ➋ Fast intermittently to boost your HGH by up to 2000%! Will These Strategies Work For You 100%? In this chapter, I showed you the gist of what my friend did to become 1.7 inches (4.3 cm) taller at age 27. Now, does this mean that you can get the same result? Before my friend implemented these strategies, his posture was flatout terrible! That’s why as soon as he fixed his posture, not only did he appear taller instantly, but his discs expanded drastically. However, if your posture is already perfect, the chances are, these tips won’t help you grow much taller. On the flipside, if you have a bad posture like my friend did, there’s a good chance you CAN become 1 to 2 inches taller. Following this guide will help you become stronger and healthier as you age. If you are 40 years or older, you probably don’t have much interest in becoming as tall as LeBron James. So this chapter isn’t really going to teach you how to grow taller. Instead, I’m going to show you how you can prevent height loss age you age. If you follow the tips I’m about to share, you’ll not only maintain your height as you age, but stay stronger and healthier for the rest of your life. So without further ado, let’s get into the last chapter of this guide. After age 40, the average adult loses almost half an inch (1 cm) every 10 years . But after age 70, a typical adult loses a total of 1 to 3 inches (2.5 to 7.6 cm) . So in this chapter, I’m going to go over what causes your height to shrink as you get older. And afterwards, I’m going to give you practical tips you can start doing to maintain your current height as much as possible. How Does Height Loss Occur? In chapter 4, I explain how you can fix your posture AND maximize your disc height. So in this chapter, we’re going to focus mainly on how to prevent your bones from becoming weaker. What Causes Your Bones to Weaken As You Age? When most adults become older, they develop a condition called Osteoporosis. To put simply: Osteoporosis describes bones that are less dense than what’s considered to be healthy. Osteoporosis is also called a “silent disease”, since it doesn’t show any symptoms. That’s why about 10.3% of American adults (over 50 years of age) were estimated to have Osteoporosis, while 43.9% of them suffered from low bone mass ! Osteoporosis can not only decrease your height as you get older, but it can also cause fractures [57, 58, 59]. By taking the right prevention steps, you can decrease your chances of developing Osteoporosis. National Osteoporosis Foundation: What is Osteoporosis and What Causes It? You are now ready to become a Height Maximizer. But before you go anywhere, I want to hear from you. 2. Which tip are you most excited to start doing? Also, if you have any questions for me, let me know by leaving a comment below right now.